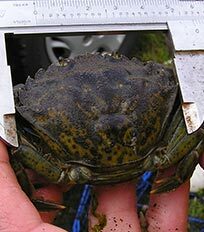 The European green crab is not known to occur in Alaska, yet it is an invasive species in the Pacific Northwest, as far north as British Columbia. The European green crab is also known as the European shore crab. It is a small, aggressive marine shore crab found in rocky intertidal and estuarine areas. Although the crab’s common name would lead one to believe they are always green in color, in fact, their coloration varies. 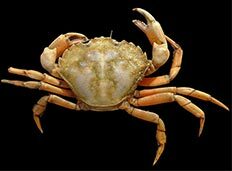 Additionally, since there are crabs native to Alaska that can have green shells, such as Dungeness crab, kelp crab, and helmet crab, color is not a good feature by which to identify unknown crabs. The dorsal (top) shell or carapace is often multicolored and mottled, ranging in color from dark or olive green to brown or grey, with yellow patches. The ventral surface (underside) color may change from green to orange and to red during the molting cycle. Rather than color, the most identifiable characteristic of European green crabs is the set of five triangular teeth, or spines, evenly spaced on each side of the carapace margin, located between the eyes and the widest part of the shell. Also useful are the three rounded lobes (bumps) between the eyes. The carapace width of an adult European green crab is typically about 2.5 inches long, but can range up to 4 inches (5.5 – 8 cm) outside of its native range. While European green crabs may resemble juvenile Dungeness crabs (Cancer magister) in shape, one can always count the spines behind the eyes: Dungeness crabs have 10 small spines, whereas European green crabs have 5 larger spines. Helmet crabs (Telmessus cheiragonous) also tend to be misidentified as European green crabs. The key difference between these two crab species is that helmet crabs have stiff hairs covering their entire body, unlike European green crabs. The European Green Crab can measure from 2.5 to 4 inches in length. The European green crab is a crustacean. Crustaceans, like all arthropods, possess segmented bodies with jointed appendages, and shed their exoskeleton in the growth process. Other crustacean features include one pair of mandibles, or jaws, and two pairs of maxillae, or mouthparts, used for feeding, sensory reception, and ventilation from a gill chamber. Crabs have four pairs of walking legs and one pair of claws. Males tend to have longer legs and larger claws than females. The sexes of European green crab can be distinguished by examining their abdomen and by observing their behavior. The abdomen of males is triangular, whereas that of females is broader and rounder. It is more difficult to distinguish the sexes of small juvenile crabs because their anatomical structures have not differentiated. Female crabs mate when they are soft-shelled which occurs immediately after molting, or shedding their hard shell. They tend to mate with males that are larger than themselves. After copulation, males will guard females until her shell has hardened. The female carries her brood of fertilized eggs on the underside of her body for several months; the length of time is dependent upon water temperature. A female European green crab can produce more than one brood after copulation. European green crabs go through six larval stages, 1 protozoea, 4 zoea, and 1 megalopa; each stage is separated by a molting event. Under favorable salinity and food conditions, each stage lasts from 8 to 11 days at 12° C and 4 to 6 days at 18°C. Zoea stages are free swimming and feed on plankton and bacteria. It is during these early life stages that European green crabs travel on currents, as part of the coastal plankton, and potentially expand their range.